ISLAMABAD (AP) — Jailed former Prime Minister Nawaz Sharif was moved from his cell to the main hospital in Islamabad after suffering heart trouble, an official said Sunday. Shaukat Javed, home minister of Punjab province, said a routine cardiogram preformed on the 69-year-old Sharif in the prison in Rawalpindi indicated the need for hospitalization. Wasim Khwaja, spokesman for the Pakistan Institute of Medical Sciences, said Sharif was in the hospital's cardiac center and his condition was stable. 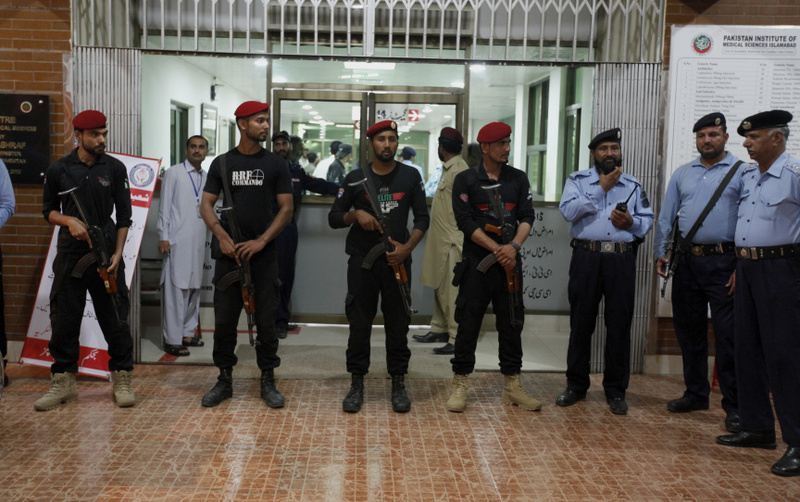 He said besides hospital security, extra police and paramilitary troops were deployed in and around the premises. Sharif was arrested along with daughter Maryam Nawaz upon returning home from London to face a 10-year prison sentence for corruption. His daughter was given seven years in the same case. He was dismissed from office by the Supreme Court last July. A court will hear their appeals on July 31. Sharif's Pakistan Muslim League party, which had run the government, lost heavily in last week's general elections to Sharif's longtime critic, former cricket player Imran Khan. Khan's party came in first but must form a coalition. Afghan President Ashraf Ghani called Khan to congratulate him on the victory. "Our focus is not on the past, but on the bright future," Ghani said, according to a statement issued from Kabul's Presidential Palace. It said that both leaders agreed to overcome the past and to lay a new foundation for a prosperous political, social and economic future of both countries. Naeemul Haq, a spokesman for Khan's party, said the would-be prime minister thanked Ghani and said that he would like to make an official visit to Kabul soon to strengthen ties between the neighboring countries. Meanwhile, political parties which did not perform well in the election continue to allege that the vote was largely fraudulent. An hours-long meeting of the leaders of former ruling party Pakistan Muslim League and the Pakistan People's Party in Islamabad concluded the elections were largely rigged. "Both the parties are in consensus that elections were rigged but we want to keep the democratic system going," said Farhatullah Babar, a spokesman for Pakistan People's Party. He said the two parties will meet again to develop a strategy but not boycott parliament. The religious parties alliance and other smaller parties have threatened to boycott parliament and start a protest campaign against the alleged irregularities. Meanwhile, election authorities continue to handle petitions for vote recounts from contenders who lost by thin margins, while thousands of votes were canceled for being marked twice. Also on Sunday, Khan's and Sharif's parties spent a busy day garnering support of candidates who won seats in Punjab province, the country's largest, as independents. Sharif's party got slightly more seats in the Punjab Assembly than Khan's party. Khan's PTI party is attempting to form a provincial government in Punjab. PTI won a majority in conservative Khyber Pukhtunkhwa province, while the People's Party dominated in southern Sindh's provincial legislature. The restive Baluchistan province, which is troubled by militant violence, was won by a mix of small parties that will have to form a coalition.